Watch our how-to video to make these easy PHILLY Stuffed Mushrooms. 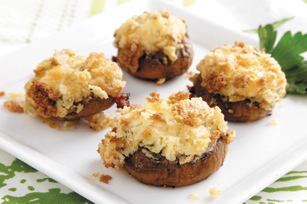 Make PHILLY Stuffed Mushrooms for a tasty appetizer that is wonderfully stress-free. Clean mushrooms. Remove and discard stems. Mix cream cheese, Italian dressing mix, mayonnaise, onion and Parmesan cheese; set aside. Put stuffing mix in separate bowl. Stuff mushrooms with the cream cheese mixture. Press cream cheese side of mushrooms into the stuffing mix until well coated. Place mushrooms, cream cheese sides up, on a baking pan, then drizzle with the melted butter. Bake for 30 min. Sprinkle with parsley and red pepper. Enjoy! Manage portions by using a smaller plate for your meals and snacks. This will help you stick to the recommended serving sizes of your favorite recipes.